SecureCRT is a Windows terminal emulator that supports the SSH protocol. You must use a secure connection like SSH to connect to a remote computer on the Engineering Computer Network. ITS (Information Technology Services) requires secure connections; other sites you want to connect to may as well. If you are working from outside the engineering secure networks and want to access a Linux workstation on the engineering network, you’ll need a program like SecureCRT. University students, staff, and faculty can use the University-licensed version of SecureCRT. Download the necessary file from the the ITS download site. You will have to read and click on I Accept export notice before you can download the software. Once downloaded to your machine, follow the directions on the ITS site to install SecureCRT. During the installation you can make choices about the installation. The Select Directory screen allows you to specify where the program is installed. On Select Profile Options you choose the program group and whether or not icons are added to the desktop and Start menu. Choose to install the Protocols and Command Line Tools that you will use. When you start SecureCRT for the first time, it configures SecureCRT. The Quick Connect screen (shown) should open by default. If not, bring up the connection screen by double clicking on the icon on the tool bar for Quick Connect or select File | Quick Connect. 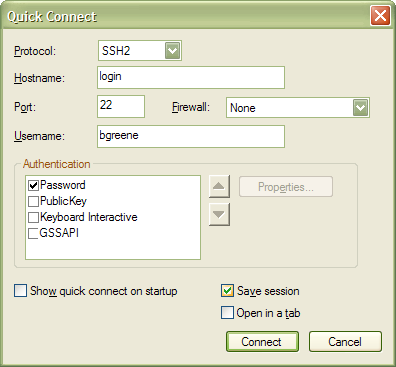 When you use SecureCRT to login to connect to a computer in the computer labs, you can use either SSH1 or SSH2. SSH2 is the default, and is a more secure and efficient version of SSH that includes SFTP, secure file transfer protocol. If you want SFTP, select SSH2. In the Quick Connect dialog, select “ssh1” or “ssh2”, depending on your need, from the protocol list. Using the hostname login (login.engineering.uiowa.edu) as shown above, or login-lnx (or login-lnx.engineering.uiowa.edu) connects to a SUSE Linux workstation. Enter your username (your engineering account) and password for authentication. If you get the message that begins “@@@@@@WARNING: HOST IDENTIFICATION HAS CHANGED @@@@@@” when you SSH to login, reply n to the prompt, “Are you sure you want to continue connecting? yes/no”. Then open the known_hosts file in the .ssh directory (in your home directory H: drive) and remove the entry for “login”. If you want help getting SecureCRT properly configured, contact the consultant at the Engineering Help Desk, 319- 335-5055, 1253 SC. If you connect to login.engineering.uiowa.edu you will connect to a Linux workstation. If you want to specify the Linux machine to connect to, in the Hostname: field, use a valid Linux machine name. SSH authenticates with your login ID and password encrypted. SSH encrypts not only the login ID and password but also the entire session. SSH also provides an integrated way to transfer files without having to open an insecure ftp connection. You must use a secure connection like SSH to connect to a remote computer on the Engineering Computer Network. The ITS Help Desk web pages about installing and using SecureCRT. Van Dyke Technologies, SecureCRT’s developer, has lots of information about the product.